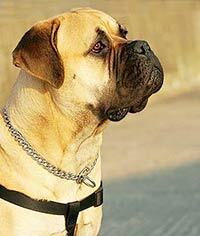 The Bullmastiff is a powerful dog breed with a broad wrinkled head and a tapering tail. Alert, strong and protective and with endurance and stamina, the Bullmastiff is a natural guardian of the home and family. 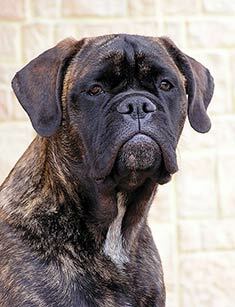 The Bullmastiff originated in Great Britain. Male Bullmastiffs range from 25 inches to 27 inches. Female Bullmastiffs range from 24 inches to 26 inches. Male Bullmastiffs range from 110 to 133 pounds. Female Bullmastiffs range from 100 to 120 pounds. Bullmastiffs are usually shades of brindle, fawn or red and some may contain white markings on the chest. Bullmastiffs have a short and dense coat, which requires minimal brushing. 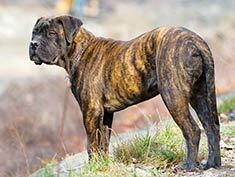 The Bullmastiff is a protective and alert dog breed who makes a good guard dog but only a fair watch dog, as they rarely bark. Devoted and loyal, the Bullmastiff loves human attention. 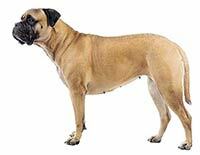 The Bullmastiff is susceptible to hip dysplasia, cancer, eyelid problems, and gastric torsion. The expected life span of the Bullmastiff is 8-10 years. Bullmastiffs will do best in a house with a fenced yard. The owner of a Bullmastiff should be a firm and confident leader who understands the power of this dog breed. The Bullmastiff is in the Working group. As the name is sometimes mispronounced, this dog indeed is "massive". Weighing in at between 100 and 130 pounds, they are typically a bit taller than 2 feet at the shoulders. The breed standard allows any shade of fawn, red, or brindle, with a black mask and dark markings around the eyes. A white marking is permissible on the chest, but nowhere else. Temperamentally, the Bullmastiff is described as courageous, loyal, calm, and loving. His fierce protective instincts allow him to defend his family against any perceived threats. His size allows him to simply intimidate, rather than attack the threat. He may stand between his family and the threat, or may knock the threatening person down and stand on him until help arrives or the family moves away from the danger. Bullmastiffs develop intense attachments to their families and want to be inside dogs. They will not do well left out in the yard all of the time, although their size limits the homes which can accommodate them. Small children are prone to being knocked over by these exceedingly large dogs, and must never be left unsupervised with them, even though the dogs are known for liking children and behaving well with them. Homes with additional dogs must be wary of adding a bullmastiff, as some will tolerate other dogs while others want to be the only love of your life. Properly socializing your dog when he is young will help him to tolerate other dogs, as well as strangers who come to visit. Check with your breeder to find a puppy with a personality most likely to fit your situation. Think you've never seen one of these dogs? Betcha' have. Butkus in the Rocky movies was a Bullmastiff, as was Robin Williams’ dog in License to Wed. However, Hooch of Turner and Hooch fame was actually a French Mastiff, not a Bullmastiff. The breed originated in England in the mid-to-late 19th Century, where they were known as the "Gamekeeper's Night Dog." His ancestry includes about 60% Mastiff and 40% Old English Bulldog. The dog was bred to protect English estates from poachers. Being the civilized people that they were, the English did not want a dog who would rip the poachers to shreds, but would simply knock them down and hold them until the gamekeeper arrived to deal with them. Although the breed is known for, and in fact was bred for, providing protection, you should never accept aggression. With a dog this large, even slight aggression can be dangerous. You simply must socialize and train your dog so that he remains under your control at all times. These dogs are relatively easy to train, and in fact, must be trained early while they are still of manageable size. Even though positive motivational training is preferable, all dogs occasionally need some hands-on intervention to get them to sit or lie down. This cannot be accomplished by most of us with a 130-pound adult dog. You will also need to curb his tendency to jump on people before he gets big enough to actually hurt someone. If you are considering adding a Bullmastiff to your home, you need to take a long, hard look at your budget first. A purebred puppy will cost between $1,800 and $3,000, depending on whether you want a companion or a show quality dog. You will feed your adult dog somewhere between 40 and 60 pounds of food per month. Of course, you will need the largest size crates, dog beds, and even toys, all of which cost more than the small sized items. Because of his large size, your Bullmastiff is likely to cause damage to your home such as ripped up carpets and furniture when he is a puppy. Your homeowner's insurance rates may go up because you own such a large breed - both for repairing damage and paying liability if your dog injures someone. As with any dog, you will have expenses related to training, boarding, and vet care. Although the dogs are generally healthy, they are prone to bloat or gastric torsion, a disease that afflicts large, deep-chested dogs. A sudden accumulation of gas in the stomach causes the stomach to twist, causing severe pain. It can result in death if not treated in a timely manner. You need to be aware that treatment can cost up to $2,000, and cannot be delayed until your next paycheck or tax refund. Another large-dog disease that may affect your Bullmastiff is hip dysplasia. This genetic disease causes the soft tissues around the hip joint to develop abnormally, pulling the ball of the hip away from its socket. As the dog walks or runs, the bones grind back together, causing arthritic changes to occur earlier than they normally would. Surgical intervention is required, at a cost of up to $2,500 or more per hip. If you have decided your budget can handle the punch a large dog packs, you will find the Bullmastiff an ideal addition to nearly any family. He can be left alone while you’re at work, although crate training is a good idea with any animal this big. They are shorthaired and shed only minimally, making grooming a snap. Bullmastiffs will bond tightly to your family, and expect to stay with you forever. Excellent with children in spite of their size, the Bullmastiff is easy-going and calm, which allows him to tolerate juvenile energy. Your Bullmastiff puppy will be extremely energetic, as all puppies are, but as he begins to age, he will require only moderate exercise. They are not a particularly high-energy breed, so one walk each day or some playtime in a moderately large fenced-in yard should be plenty. You can even use the playtime and walk time as a teaching moment, reinforcing the fact that you are the human and you are in charge. Even though Hooch was not a Bullmastiff, Tom Hanks' tour of the house with him is apropos here: "This is not your room!" Show your Bullmastiff you are the boss, then just enjoy the heck out of him as a family pet - you will not find one that is more loyal, courageous, and loving. Find Bullmastiff Puppies with our Free Breeder search!